When Duryodhana won Draupadi in the dice game, he asked his brother Dushasana to bring Draupadi. Dushasana grabbed Draupadi by her hair and dragged her to court. Draupadi appealed to everyone, "I am the honour of this family. Why is everybody sitting and watching me being disgraced? When Yudhisthira had lost himself in the game, did he have any right to stake me?" The Pandavas could not do anything, as they were now servants of Duryodhana. 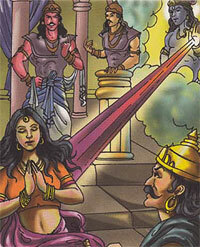 Karna asked Dushasana to strip Draupadi of her clothes. Dushasana caught hold of one end of her sari and started pulling it. Helpless, Draupadi prayed to Krishna. To everyone's amazement, Dushasana kept pulling the sari but it would not end. In this way Krishna saved the honour of his devotee.